March | 2009 | NICE! Site promoting Coca Cola and their social and environmental work in South & Latin America. 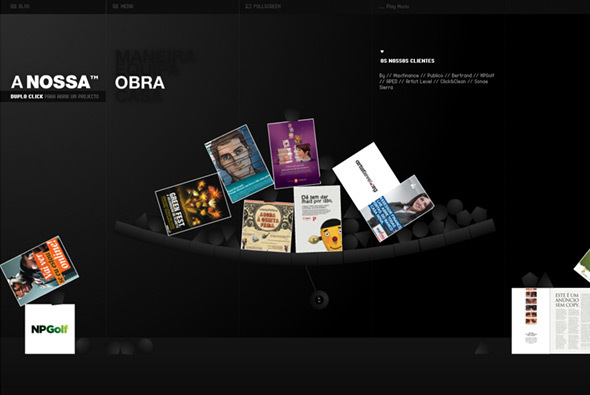 Really nice, clean, simple site featuring a showcase of projects Coke have been involved with. 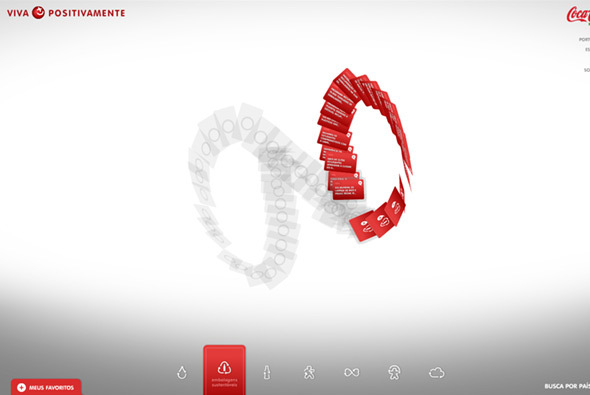 Featuring a 3d interface, each category has little cards which float around forming a shape, i.e. a coke bottle, a globe and so on. Really slick, smooth 3d interface, well designed buttons and loads of attention to detail. 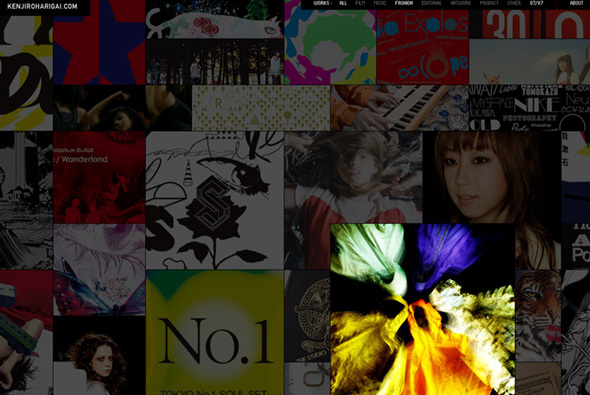 Site promoting Japanese online clothing store Hoop. 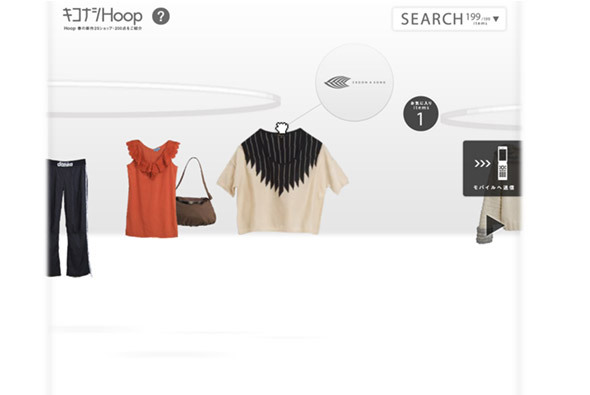 What I like is the user interaction and unique way of browsing products, using a nice drag and drop metaphor for shopping in the real world, you can flow through the available products and pick and drag any item into your own shopping rack – for purchase later. But it’s the polish and interactivity that really makes it, feels very tactile and becomes quite fun to pick up items, which react to your mouse movement in a ‘realistic’ way. Site promoting a re-release of Pearl Jam’s album 10. 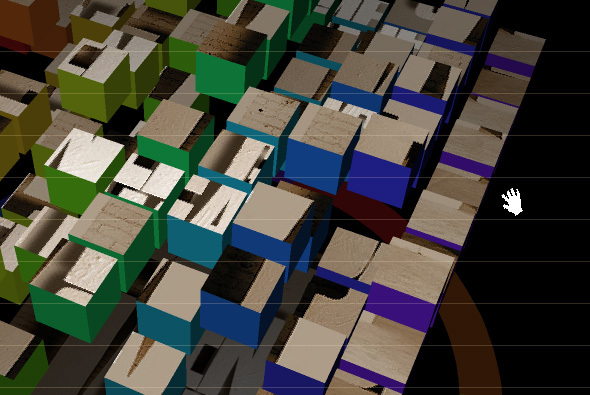 Featuring a 3d puzzle game, where you have to drag the blocks into the correct place to unlock tracks to listen to. I like the polish of the 3d element, nice lighting and interesting way of interaction, grabbing the blocks and dragging them around, dragging your view around, it all feels quite intuitive. Created by Freedom & Partners. Very simple site of +1 Music, who create special events to promote artists. Nice way of navigating, you can scroll all over, by clicking on work the respective section opens up and places all the information on screen, leaving you to scroll around at will, zooming in/out of videos and photos. Cool interaction and interface design, simple, effective and to the point. Very slick site promoting K Swiss products, asking the questions ‘who wears K Swiss now?’. With 14 celebrities each with short video clips and photos, talking about their lives, similar in format to the recent Nike site featured on this blog. What I like is the production value, nicely shot videos and photos, all in b&w, very slick interaction, and more 3d interfaces! Nice depth perception and depth of field effects on the gallery of the celebrities and their photographs. 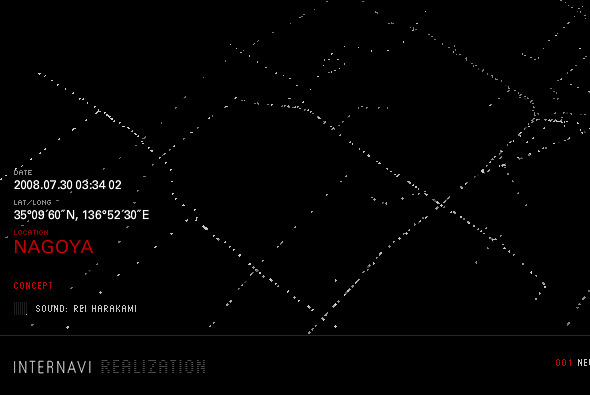 Nice design and interface, great animation and interactivity which all helps to bring it alive, particularly like the way the camera moves around the scene and the great design. 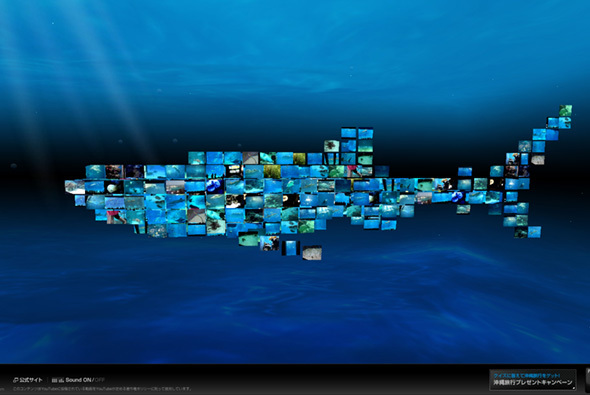 Created by Dentsu, Semitransparent, Metaphor, and Shipoo. Interesting new site of Armani Jeans. Presented in a very cool way – from a first person perspective, you are given a 360 degree view as you run around with models wearing Armani Jeans clothing, with the action stopping at intervals so you can view the products and view the catalogue and so on. 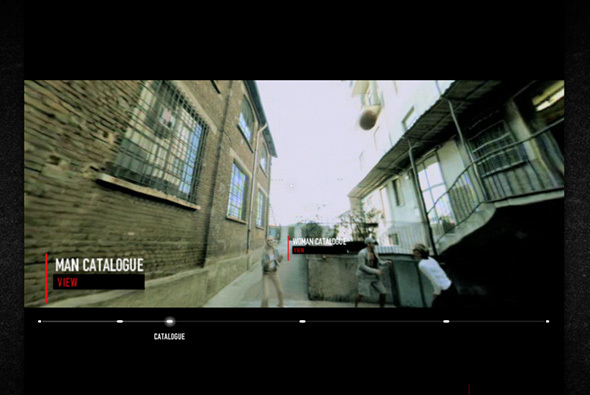 What I like is the way the ‘video’ is presented with you being able to look around as your view and the actors move through the environment. It’s a very simple site with an interesting way to show the product line ‘in situ’, with a very cool interface, very clever. 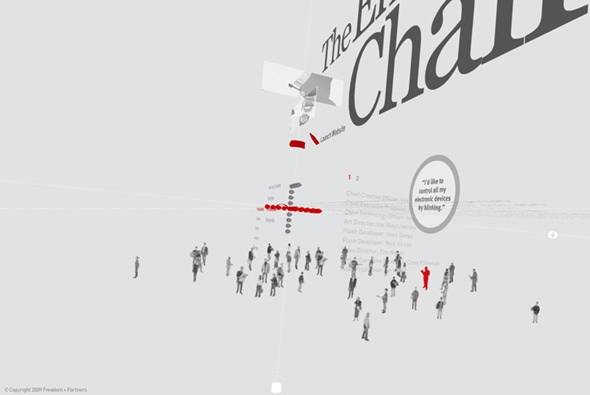 Created by Saatchi & Saatchi Rome. 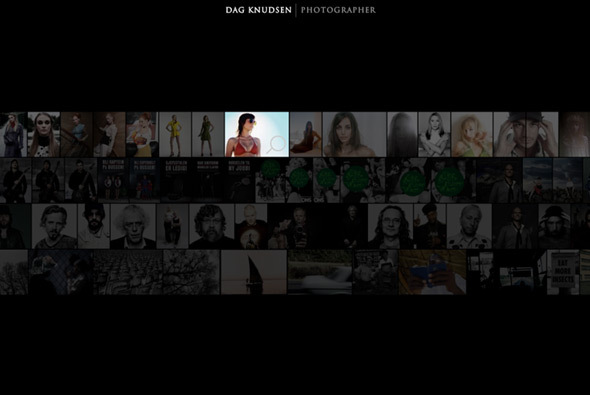 Site of photographer Dag Knudsen. Simple site giving an overview of shots in a contact sheet style, you zoom in/out into the whole interface and flick through the images. Nice transitions and very clean and to the point. Nice! 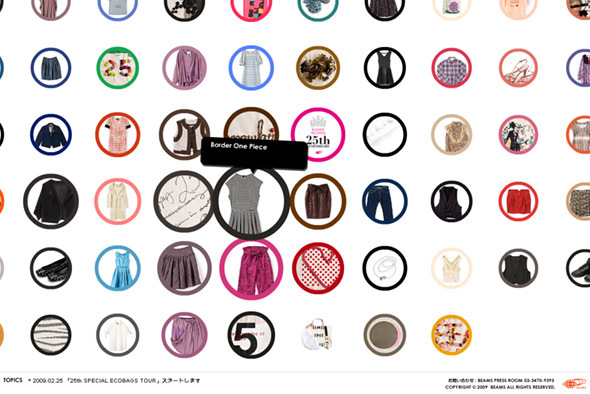 Site promoting Beams, specifically Women’s clothing 25th anniversary. A very simple interface showing thumbs of the items, when you click on an item they have used a really nice way of zooming in/out of the photo. You hold down your mouse button to zoom in / pan around (with the item slightly rotating on left/right movement) and let go to zoom out, complete with nice little sound fx. Again another typically Japanese site design, where the interface and interaction design is top notch, the site is fun and simple to use.